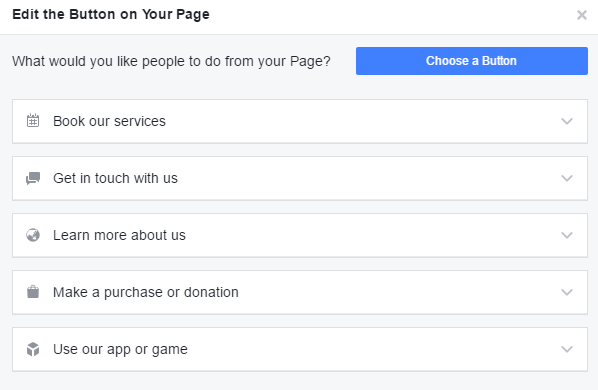 You may think setting up a Facebook page is as easy as pie, but there are several key elements that you don’t want to miss. 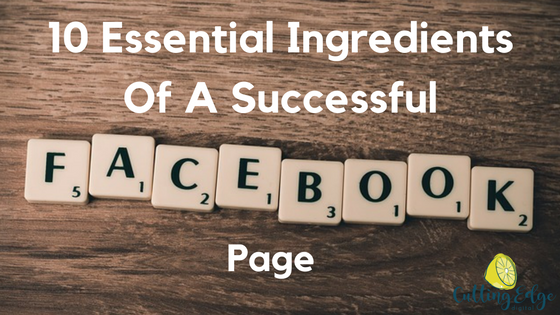 Having a well-optimised Facebook book will help to attract and retain your audience, so make sure you add these 10 essential ingredients if you want the perfect recipe to a successful and engaged Facebook page. Your profile picture needs to be instantly recognisable. The obvious choices are your logo or a picture of yourself if you are the face of your brand. Don’t change your profile picture every 5 minutes either; it can be very confusing for users, especially if the images you use are not synonymous with your brand. Having a low resolution cover photo, or a badly fitting one is not a good idea. 851×315 is the optimal size for a Facebook cover photo, but bear in mind that on a mobile device, this may get cut off on the edges so if you’re going for a mobile target audience, don’t have any key information towards the sides of the image. Canva is one of my favourite tools and is great for creating images which are the correct size for any social media platform, so if you haven’t used it yet, check it out! When you first set up your Facebook page, you’ll get a string of random numbers and letters as your Facebook page URL. But, did you know that once you hit 25 likes, you can update this to a custom URL, so as an example, mine is https://www.facebook.com/CuttingEdgeDigital/. Invite your friends and family to like the page so you can hit the 25 mark to get your custom URL set up, then go into your page settings and create your custom URL. 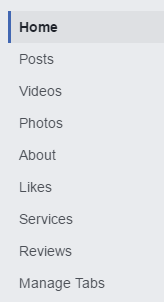 Hovering over your cover photo, you have the option to add a Call To Action button. It’s a great way to get people to do exactly what you want them to do – whether that’s visit your website, send you a message, make a purchase or book an appointment. Under each of the actions you can choose from, are the button options, including Contact Us, Sign Up, Book Now, Shop Now, Learn More, Email Now and Call Now. 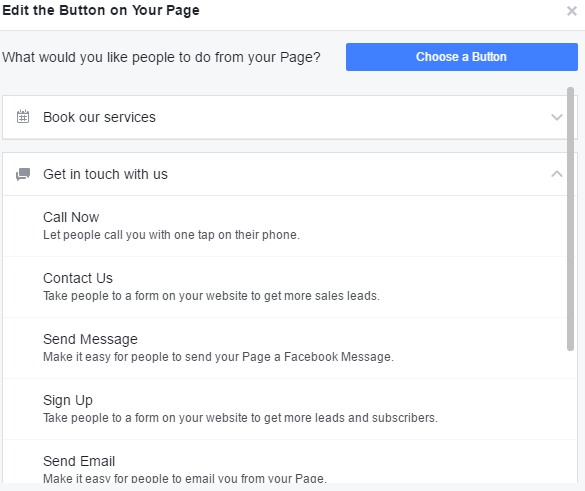 It’s a great opportunity to direct your audience to do the very thing you want them to do, so a Call To Action button is essential for every Facebook page. If you have a physical address, make sure you add your location to your Facebook page. If you don’t have a physical location that you want to share publicly, add as many contact options as possible to your page information – email address, phone number etc. Add as much information as possible to your About section. Most people want to find out as much as they can about you before they even get in touch, so give them everything they could possibly need to find out what they want to know about you and your business. This will help to facilitate them getting in touch with you to ask a question, get a quote or make a purchase. 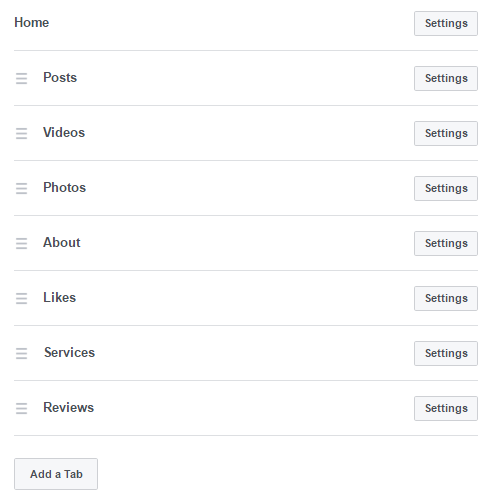 Many people aren’t aware they can re-order their tabs on their Facebook page. This is a great way to showcase what you want people to see first and even remove sections you’d rather they didn’t see or aren’t relevant to your page. You can do this on the left hand side of your page – at the bottom of the list is the ‘Manage Tabs’ option. If you have a post you want to get more visibility, such as a change to how you operate, a new product or service or a competition, you can pin this post to the top of your page. This means that it will be the first post anyone sees when they come to your page, regardless if you post other updates after it. 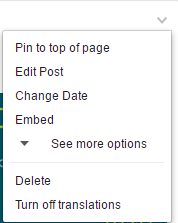 To do this, click on the arrow at the top right of the post you want to pin and choose ‘Pin to top of page’. When you want to unpin it, do the same and choose ‘Unpin’. Now this is a completely personal choice, but you can choose whether to activate your reviews tab. Reviews do help to build credibility and allow your audience to see how you operate and respond to people. Sometimes there are unfortunate incidents where competitors or a disgruntled customer will go out of their way to write and spread bad and often untruthful reviews, so in this case, disabling reviews can be considered. Once a review is posted, you cannot remove it (if it is clearly fraudulent, you can report it to Facebook but people have varying measures of success as to whether they get removed). With reviews from social media platforms now starting to pull through to organic search results, it’s becoming more important than ever to try and collate good reviews to build online credibility. 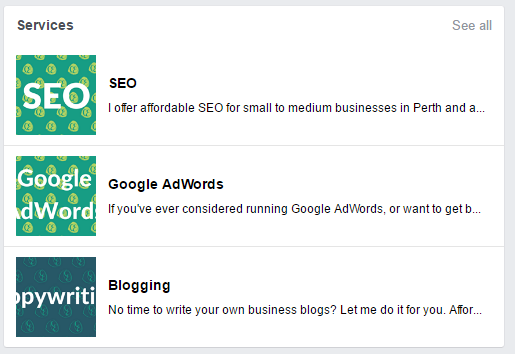 One of the newer features of Facebook pages is the ability to add your products or services to your Facebook page. These sit near the top of your page and can describe what you offer and include images, descriptions and price points if you choose. You can add your products/services and then go to ‘See All’ and drag to re-order as you want them to appear, otherwise they appear in the order you last added them. If you follow these tips, you’ll have a well-structured and optimised Facebook page, ready to engage, build and convert your audience into loyal customers. What would you add to this list? Great tips Reeva! very well put together…. a couple of things added to my to do list now! Your page is amazing and sooooo helpful. So much to do 🙂 Thanks for all these amazing posts.